by Paul V. Loiselle, Ph.D.
Axelrod, H.R. and L.P. Schultz. 1969. Handbook of Tropical Aquarium Fishes. T.F.H. Publications, Jersey City, pp. 1–718. Verlag, Melle, Germany, pp. 1–1211. Bleeker, P. 1863. Systema Cyprinoideorum revisum. Nederlandsch Tidschrift voor den Dierkunde 1: 187–218. Conway, K.W., W.-J. Chen, and R.L. Mayden. 2008. The “Celestial Pearl danio” is a miniature Danio (s.s.) (Ostariophysi: Cyprinidae): evidence from morphology and molecules. Zootaxa (1686): 1–28. Fang, F. 2003. Phylogenetic analysis of the Asian cyprinid genus Danio (Teleostei: Cyprinidae). Copeia (4): 714–28. Fang, F., et al. 2009. Molecular phylogenetic interrelationships of the South Asian cyprinid genera Danio, Devario and Microrasbora (Teleostei, Cyprinidae, Danioninae). Zoologica Scripta 38 (3): 156–237. Hamilton, F. 1822. An account of the fishes found in the River Ganges and its branches. A. Constable and Co., Edinburgh and London, pp. i–vii, 1–405. Heckel, J.-J. 1843. Ichthyologie von Syrien. In: J. Von Russenger. Reisen in Europa, Asien und Afrika. Vol. 1 (2). E. Schweizerbart’sche Verlagshandlung, Stuttgart, Germany, pp. 990–1099. Hora, S.L. 1937. Notes on fishes in the Indian Museum. XXXI. On a small collection of fish from Sandoway, Lower Burma. Records of the Indian Museum (Calcutta) 39 (4): 323–31. Kottelat, M. 2013. The fishes of the inland waters of Southeast Asia: a catalogue of the fishes known to occur in the freshwaters, mangroves and estuaries. Raff Bull Zool Suppl (27): 1–663. fishes of Western Indonesia and Sulawesi. Periplus Editions, Jakarta. Loiselle, P.V.2013. Genus Tanichthys: White Clouds, Meteor Minnows and Sparking Gems. Amazonas 2 (4): 50–58. Menon, A.G.K. 1999. Freshwater Fishes of India. Rec Zool Surv India Occ Paper (175): i–xvii, 1–366. Myers, G.S. 1924. On a small collection of fish from Upper Burma. American Museum Novitates (156): 1–7. ———. 1953. Classification of the Danios. Aquarium J 24 (10): 235–38. Riehl, R. and H. Baensch. 1982. Aquarium Atlas, Vol. I. H.A. Baensch GmbH, Melle, Germany, pp. 1–992. Roberts, T.R. 2007. 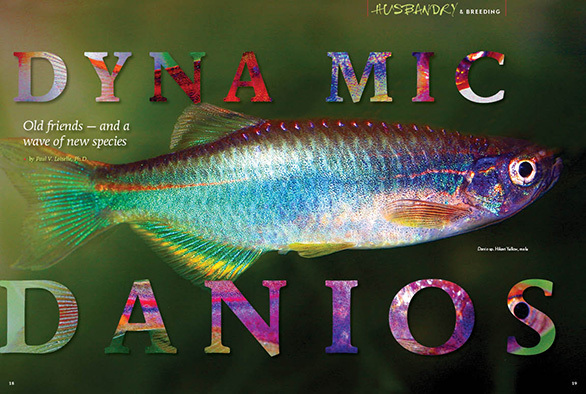 The “Celestial Pearl Danio,” a new genus and species of colorful minute cyprinid fish from Myanmar. Raff Bull Zool 55 (1):131–40. Shresthra, T.J. 2008. The Ichthyology of Nepal. Himalayan Ecosphere, Khatmandu, pp. i–viii, 1–388. Smith, H.M. 1945. The fresh-water fishes of Siam or Thailand. Bull US Nat Mus (188): 1–622. Sterba, G. 1962. Freshwater Fishes of the World. Revised English language edition. Studio Vista Ltd, London, pp. 1–878. Talwar, P.K. and G. Jhingran. 1992. Inland Fishes of India and Adjacent Countries. Vol. I. A.A. Balkema, Rotterdam, pp. i–liv, 1–366. Vidthayanon, C., A. Termvidchakorn, and M. Pe. 2005. Inland Fishes of Myanmar. Southeast Asian Fisheries Development Center, Bangkok, pp. 1–160. Weber, M. and L.F. de Beaufort. 1916. Fishes of the Indo-Australian Archipelago. III. Ostariophysi. II. Cyprinoidea, Apodes, Symbranchi. E.J. Brill, Leiden, Germany, pp. i–xv, 1–455. I like this article a lot! I know a lot on this subject and felt like I learned a bunch more.